Government organizations differ significantly from private sector organizations in terms of their processes, culture, and ways of working. Plagued with phlegmatic and often lackadaisical work systems, government organizations tend to resist dramatic changes usually associated with technology based interventions. This study examines the effect of one dominant factor, organizational culture, on the success of e-government initiatives. To test the research model, survey data was collected from 315 respondents in 13 government organizations in India. The results indicate that a government organization which performs well on e-government projects exhibits specific cultural traits. Results also indicate that bureaucratic dimension, which emerges as the dominant cultural dimension in government organizations, is both positively and negatively related to e-government performance dimensions. The supportive and innovative dimensions of organizational culture are positively related to work process improvement and the job satisfaction of the user associated with e-government projects. Implications for practice and research are provided by interpreting the results in the context of the process paradox. The results show that while government and public sector organizations can use culture to positively impact efficiency dimensions of e-government performance, the dominant bureaucratic culture will tend to hinder systemic and enterprise-wide e-government performance. The term e-government refers to the use of information and communication technology (ICT) to improve and better the functioning of government systems, improve the delivery of government services to citizens, facilitate better interactions with other agencies or empower citizens through access to information. For instance, the World Bank defines “E-Government” as “the use by government agencies of information technologies (such as Wide Area Networks, the Internet, and mobile computing) that have the ability to transform relations with citizens, businesses, and other arms of government” (World Bank, n.d.). Over the last decade, many government agencies and departments across the world have strengthened their IT-enabled internal operations (Layne & Lee, 2001) and have moved to on-line services to citizens (Ho, 2002). It is generally hoped that these initiatives will result in improved operations and services. However, the success of such initiatives has tended to be small-scale and gradual. Any initiative at the government level in general and technology initiative such as e-government in particular faces a plethora of issues such as budget scarcity, group conflict, cultural norms, and prevailing patterns of social and political behavior (West, 2008). Usually, government organizations are plagued with phlegmatic and often lackadaisical work systems (Light, 1997) compared to private sector companies which tend to exhibit more organized work systems (Boyne, 2002). Typically, technology initiatives in government organizations are caught between competing requirements among various government agencies which make it difficult to promote technological innovation associated with e-government initiatives. Government organizations are also characterized by strong political processes (Heftez & Warner, 2004) which tend to encourage conflict over resources. Therefore, the success of any e-government initiative is likely to be impacted by the way the government organization collectively reacts to the IT intervention and the way individuals in the organization respond to the initiative. Clearly, the transition to a “genuinely integrated, agile, and holistic government” (Dunleavy et al., 2005, p. 489) is tempered by ground realities – those that include political processes, cultural assumptions and structural constraints. Our study is motivated by the need to address one of these influencers of e-government – culture. Organizational culture is an important aspect that can potentially affect the success of IT initiatives in organizations. Past studies confirm that a key piece of organizational infrastructure for e-government lies in changing internal government employee culture or the way that things are done in an organization (Peters & Waterman, 1982). Culture, within an organization, can be thought of as a way of life and could have significant impact on organizational performance (Wilkins & Ouchi, 1983). Peters and Waterman (1982) were possibly among the first authors to popularize the notion that having a strong culture is a key to organizational success. In case of government organizations, culture can resist dramatic changes, usually associated with technology based interventions, within a short period of time (Seifert & McLoughlin, 2007). 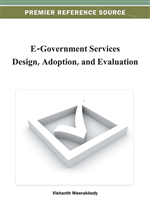 Government organizations typically tend to exhibit strong cultures (Rainey & Steinbauer, 1999) that can inhibit or facilitate the success of various initiatives including the e-government initiatives. The rapid changes in the technology can create additional challenges for government organizations in terms of keeping pace with innovations. This can further accentuate willingness of government organizations to change course and alter the way they work. In such a situation, any e-government initiative instead of bringing positive change in government performance may actually lead to decline in performance.